Morris Ketham was both a broker with offices at No. 47 Wall Street, and the owner of an iron works in New Jersey. In 1846 he began construction on a row of four upscale homes on the fashionable block of West 10th Street, between Fifth and Sixth Avenues. Upon their completion in 1847 Ketham sold of the three residences to James Grosvenor; while No. 61 was sold to the Fairfield County Bank. Ketham moved to Greenwich, Connecticut not long afterward. At 26-feet wide and three-and-a-half stories tall, No. 61 was commodious. Sitting above a brownstone-fronted English basement, it featured the expected architectural details of a late Greek Revival home--a sturdy brownstone-framed entrance, stone cornices above the windows, and squat attic windows. It appears the bank soon sold the house to flour merchant David D. Crane, whose professional interests included a directorship in the People's Fire Insurance Company. Crane was the victim of a bold robbery in his store at No. 45 Jay Street on November 21, 1861. He was alone in the shop when a man came in an requested to borrow a directory. As he thumbed through the pages, a customer entered and involved Crane in a discussion. While Crane was distracted, the first man made his way to the money drawer and removed $277 in cash and two checks totaling $250. By the time Crane realized what was happening, the crooks escaped. They made off with the equivalent of more than $15,000 today. Although Henry Mallon and Ramsey Crooks were soon apprehended, The New York Times reported "Neither the money nor checks have been recovered." The Cranes suffered another tragedy in January 1864 when their 20-year old son, Henry Alonzo, died. Unlike his sister's, Henry's funeral was not held in the house, but in the Reformed Dutch Church at Bleecker and West 10th Streets. At the time the numbering of this section of West 10th Street started at Sixth Avenue. It would not be until the 1870's that No. 61 received the new address of 15. It next became home to the Arthur John Peabody family. Peabody was the son of Jeremiah Dodge Peabody and the former Ellen Murray Hanna. The family traced its American roots to Thomas Peabody who arrived in 1635. He was a member of Charles Scribner & Co., publishers. His personal fortune had been augmented following the death of his uncle, George Peabody in 1869. The New York Herald mentioned "Mr. Peabody left an immense fortune to his relatives, far beyond the amount going the rounds of the papers." Two years later, on May 9, 1871, the 36-year old married Eleanor Elliot Russell and it may have been shortly after that they moved into No. 15. They would have four children: Arthur, George, Anna and Helen. It was most likely the Peabodys who updated the house. Brawny Italianate style newels and fencing replaced the originals, and a new cornice and hooded entranceway in the same style were added. Peabody's retirement on February 1, 1872, immediately following the death of Charles Scribner, necessitated a reorganization of the firm. The Book Buyer noted "the firm of Charles Scribner & Co. is dissolved." In December 1875 Peabody was among the two dozen respected gentlemen from whom a jury in the city's case against the notorious Tammany Hall "boss" William M. Tweed would be chosen. Jury selection was markedly different at the time, the concept of a random culling of the population totally alien. Among the other potential jurors were millionaires Anson G. P. Stokes, Levi P. Morton, Amos R. Eno and Abner W. Colgate. Along with his elevated interests--he was a member of the American Geographical Society, the Metropolitan Museum of Art, the American Museum of Natural History, the New-England Society and the New-York Historical Society--Arthur was highly involved in philanthropies. He helped found, for instance, the Five Points House of Industry. On August 5, 1888 the New-York Tribune published a long article entitled "The Newport of Long Island." It described in detail the new Southampton district which had become a fashionable summer resort. 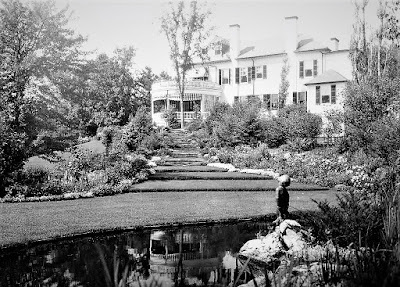 "The new town forms an exceedingly interesting study in sociology, Without special attractions and without advertisement it has become within ten or twelve years the wealthiest and most aristocratic resort on the Long Island cost." Among the first to discover, and in fact develop, Southampton were the Peabodys. The rented The Mallows, a "cottage" on the shore of Lake Agawam from 1883 through 1886. Beginning in 1886 they began buying acreage surrounding that house from the estate of Thomas N. White. 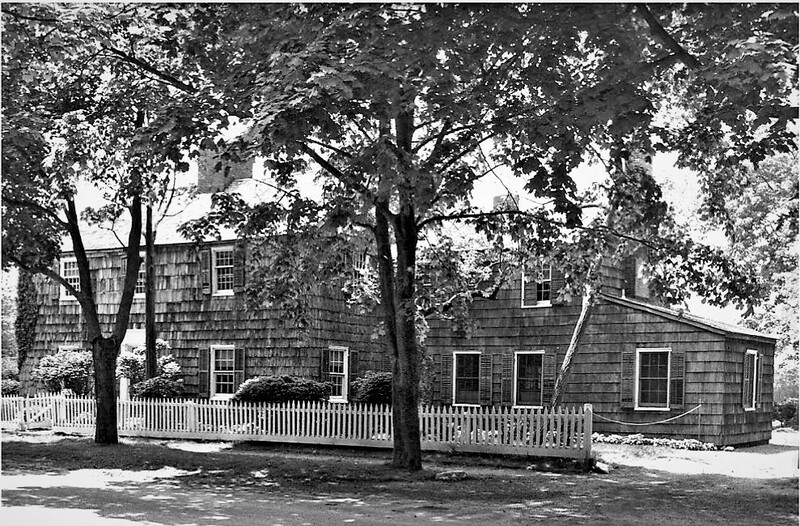 On their property was a 17th century saltbox house built for settler Thomas Halsey, Jr. The Peabodys created a compound by erecting three other houses, and they remodeled the vintage Halsey house to a guest house. 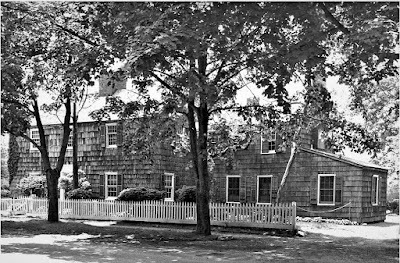 The main house, Agawam, was a showplace in the neighborhood. Eleanor, like all women of society, engrossed herself in charitable works. She was a manger of the Home for the Destitute Blind. On March 6, 1894 The New York Times reported "An important social incident of next week will be a vaudeville performance in aid of the Orthopedic Ward of the Post Graduate Hospital and the Shelter for Respectable Girls, to be given at the home of Mrs. Arthur J. Peabody of 15 West Tenth Street. By now the Peabody children were coming of age. When the engagement of Arthur Russell Peabody to Mary Temple Emmet was announced on September 7, 1894 society anticipated a fashionable ceremony. That would not happen. On October 22 the New-York Tribune reported "The friends of Miss Mary Temple Emmet and Archibald Russell Peabody were surprised when they learned yesterday that the young couple were quietly married on August 23 last." The pair had slipped off to the South Third Street Presbyterian Church in Brooklyn in secret. The newlyweds moved to Gallatin, Tennessee. Eleanor turned her attention to daughter Anna's coming out. The New York Times said Anna "is well known in the younger set, and has been a belle at the dancing classes." A reception was held in the house on December 3, 1894. The Sun reported "There were more than 500 callers." That evening a cotillion was held at Sherry's. In the fall of 1895 Arthur and Mary Peabody returned to New York for a visit. Oddly enough, they did not stay at No. 15, but in the New-Amsterdam Hotel. In mentioning that they were in town that September, The Times society columnist could not help dredging up the past. "Mr. Peabody's elopement with Miss Emmit [sic]...in the Fall of 1893 caused a great deal of comment." The couple may have returned for the celebration of Arthur and Eleanor's 25th anniversary. On November 16 they took "forty-five of their friends" to see actor Frank Daniels in The Wizard of the Nile at the Casino Theatre. Afterward the party ate at the Waldorf. Members of society who still waited for a fashionable Peabody wedding were not disappointed when Anna Rutherfurd Peabody married John T. Wainwright in Calvary Church on April 19, 1897. Members of the wedding party represented some of the oldest families in Manhattan society--Livingston, Van Rensselaer, and Iselin among them. The reception was held in the 10th Street house. Helen would be introduced during the winter season of 1898-99. The event triggered, as expected, a flurry of invitations and followed by Helen's name routinely appearing in society columns. At the age of 68, Arthur J. Peabody died on January 13, 1901 of pneumonia. He had contracted influenza about ten days earlier. His funeral was held in Calvary Church where the family were members and where his daughter had been married. That same year Arthur, Jr. moved back to New York and into the 10th Street house with Mary and their two children. He first entered the law firm of J. Murray Mitchell; then went into partnership with Clifford W. Hartridge. While he enjoyed a large practice he would forever be remembered for representing Harry K. Thaw in the murder case of Stanford White. Following the death of John Wainwright Anna seems to have also moved back into No. 15 with her mother. Her wedding to Dane Appleton Pierson on June 24, 1903 took place in the house. On September 23, 1908 Arthur died at Agawam, after catching pneumonia. His wife accompanied his body to the Peabody house on 10th Street where the wake was held before his funeral in Calvary Church. The residence was the scene of Helen's wedding to Pennington Satterthwaite on June 28 the following year. Because the family was still in mourning, there were no bridesmaids or ushers. The Sun reported that "The drawing rooms will be ornamented with palms, roses and peonies." The youngest of Eleanor's children, George Russell Peabody, was married five months later, one month after the mourning period ended. His bride, Natalie Clews, came from one of Manhattan's wealthiest and best known families. The ceremony in fashionable St. Thomas's Church on Fifth Avenue was attended by families with names like Goddard, Huntington, Livingston and Baylis. The following year, on November 4, 1910, Eleanor E. R. Peabody died in the 10th Street house. Her funeral was held in Calvary Church three days later. The Peabody heirs sold No. 15 to Barlett Arkell in December 1912. Arkell paid $38,000 for the property; in the neighborhood of $970,000 today. He was the founder and president of the Beech-Nut Company, a food packing and canning firm. Arkell was credited with revolutionizing the packing of vegetables and fruits by turning from glass jars to vacuum-packed cans, invented by his engineers. In 1909 the firm had branched out into sweets by introducing Beech-Nut Chewing Gum. Arkell and his second wife, the former Louisiana Grisby, had a son, William Clark Arkell. The couple made a change to the appearance of the house in the summer of 1914 when they hired architect Clarence l. Sefert to change the windows and install a charming copper clad bay at the second floor. Long panels of diamond-paned windows made for a cozy window seat inside. The updates cost the equivalent of just over $20,000 today. Then, in April 1916 he commissioned the architectural firm of Marion, Sims, Wyeth to build a "new platform roof garden." Before long the Arkells turned their attention a new summer estate. Louisiana was a native of Manchester, Vermont and in 1920 they purchased a Colonial Revival cottage at nearby Manchester-In-The-Mountains. It was built by the seller, Henry W. Brown, in 1900. They renamed it Point-of-View. On August 1, 1920 the New-York Tribune reported "Mr. and Mrs. Barlett Arkell have been christening their new home, Point-of-View, with a house full of guests." The following June the newspaper noted "Mrs. Barlett Arkell, of New York, is making extensive improvements about Point of View." The Arkells' were collectors of American art, filling both their homes with works by artists like Winslow Homer and Frederic Remington. Their cultural interested extended to music and in 1922 Barlett Arkell was one of the founders of the City Symphony Orchestra. Like most moneyed businessmen, Arkell spent many summer weeks in New York, returning on the weekends to join his family at Point-of-View. He was on a train to Vermont on Friday, September 23, 1927 when he received a telegram informing him that Louisiana had suffered a fatal heart attack. Her body was returned to New York in time for a funeral in the 10th Street house two days later. Society may have been a bit surprised when word from Paris arrived in New York on June 15, 1929 that Arkell had married Louise Ryals de Cravioto. The New York Times noted "Mrs. Akrell was formerly the wife of Senor Carlos de Cravioto of Mexico City." The aging newlyweds returned to No. 15. In 1933 an elevator was added, no doubt a welcomed convenience for the 71-year-old Arkell. Entertainments in the house were sometimes lavish, like the dinner given for 30 guests on June 14, 1934. Just prior to his 79th birthday on June 10, 1941, Arkell retired from the presidency of Beech-Nut. He spent his birthday at Point-of-View, requesting that "no special notice" be made of the day. Nonetheless, according to The New York Times, "He received calls from many local friends and felicitations from all parts of the country by wire for two days." Following Arkell's death at Point-of-View on October 13, 1946, Louise continued to live on at No. 15. She busied herself with charities, hosting a benefit event in the house in 1950, for instance, and a committee meeting for the Friends of the Philharmonic here in October 1954. The Arkell house was by now somewhat of an anachronism--most of the refined 19th century homes along the block having been converted to apartments. But Louise stayed on until her death in the house on January 7, 1970 at the age of 84. Having survived as a private family home for 125 years, No. 15 was converted to apartments. 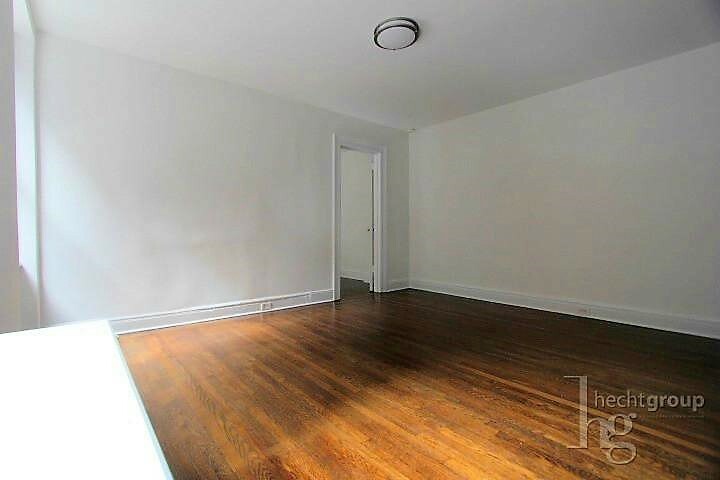 The venerable interiors were ripped out to be replaced by featureless drywall. Then around 2017 a conversion was begun to return the house to a private home. While the interiors have been sadly lost; the facade remains essentially as it was when the Arkells added the copper bay in 1914. Random question, but the brownstone cornices made me think of it . On a lot of these old townhouses, the cornices or lintels have been shaved off in more recent times. Why is this done? After the middle of the 20th century much of the Victorian embellishments were removed to modernize the appearance of the buildings, making them less dated. As for some cornices, they became unstable and dangerous. Rather than replace or repair them, they were simply removed.